Immunogen: Synthetic peptide corresponding to the sequence near the N-terminus of rat bradykinin receptor B1. Predicted MW of ~38kDa. observed by Western blot MW species (~ 38kDa) and intermediates also observed by Western blot which reflect post-translational modification of the receptor. Scientific Background: Bradykinin (BK) is a nine-amino acid peptide produced by kallikrein cleavage of kininogen precursor proteins in tissue and plasma, and is an important regulator of vascular and pain responses to tissue injury. Two receptors (B1 and B2) have been identified as mediators of BK signaling, and are both members of the seven-transmembrane domain-containing G-protein coupled receptor (GPCR) family. The B2 receptor is constitutively expressed in smooth muscle and neurons, whereas B1 expression is induced following tissue injury or during inflammation. The B2 receptor displays high affinity for BK and Lys-BK peptide agonists, while the B1 receptor displays highest affinity to des-Arg9-BK and des-Arg10-kallidin. Both receptors are best characterized as signaling via coupling to Gq alpha subunits (particularly Gq/11), leading to activation of phospholipase C beta, hydrolysis of PI, and an intracellular increase in free calcium, although coupling through Gi, Gs, and G12/13 has also been observed. Western blot analysis: MW marker (1) and 25µg rat heart extract (2) probed with Bradykinin Receptor (B1) pAb at 0.75µg/ml. 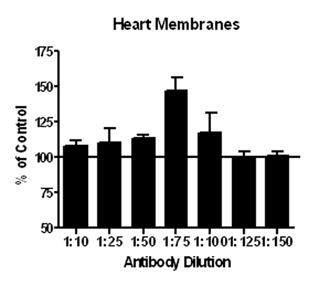 Membrane ELISA: Lewis rat heart membranes (5µg/well) were treated with 1 μM concentrations of agonist (BK-1-8) and probed with Bradykinin Receptor (B1) pAb (1:10 to 1:150 of a 0.1µg/μl stock solution) by ELISA. Data from vehicle treated cells were taken as 100%. Results are the mean ± SEM (n=6).